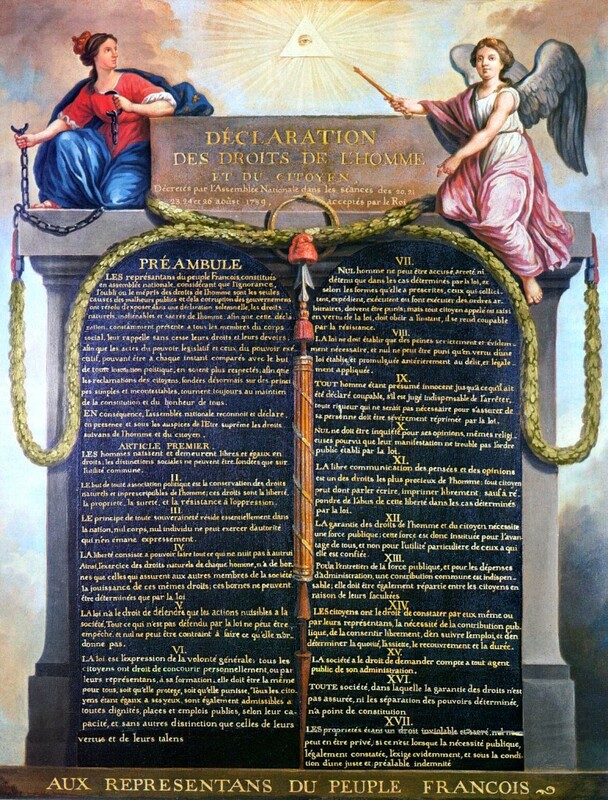 The Representatives of the French people, organized in National Assembly, considering that ignorance, forgetfulness, or contempt of the rights of man are the sole causes of public miseries and the corruption of governments, have resolved to set forth in a solemn declaration the natural, inalienable, and sacred rights of man, so that this declaration, being ever present to all the members of the social body, may unceasingly remind them of their rights and duties; in order that the acts of the legislative power, and those of the executive power, may at each moment be compared with the aim and of every political institution and thereby may be more respected; and in order that the demands of the citizens, grounded henceforth upon simple and incontestable principles, may always take the direction of maintaining the constitution and welfare of all. 1. Men are born free and remain free and equal in rights. Social distinctions can be based only on public utility. 2. The aim of every political association is the preservation of the natural and imprescriptible rights of man. These rights are liberty, property, security, and resistance to oppression. 3. The sources of all sovereignty resides essentially in the nation; no body, no individual can exercise authority that does not proceed from it in plain terms. 4. Liberty consists in the power to do anything that does not injure others; accordingly, the exercise of the rights of each man has no limits except those that secure the enjoyment of these same rights to the other members of society. These limits can be determined only by law. 5. The law has only the rights to forbid such actions as are injurious to society. Nothing can be forbidden that is not interdicted by the law, and no one can be constrained to do that which it does not order. 6. Law is the expression of the general will. All citizens have the right to take part personally, or by their representatives, and its formation. It must be the same for all, whether it protects or punishes. All citizens, being equal in its eyes, art equally eligible to all public dignities, places, and employments, according to their capacities, and without other distinction than that of their virtues and talents. 7. No man can be accused, arrested, or detained, except in the cases determined by the law and according to the forms it has prescribed. Those who procure, expedite, execute, or cause arbitrary orders to be executed, ought to be punished: but every citizen summoned were seized in virtue of the law ought to render instant obedience; he makes himself guilty by resistance. 8. The law ought only to establish penalties that are strict and obviously necessary, and no one can be punished except in virtue of a law established and promulgated prior to the offense and legally applied. 9. Every man being presumed innocent until he has been pronounced guilty, if it is thought indispensable to arrest him, all severity that may not be necessary to secure his person ought to be strictly suppressed by law. 10. No one should be disturbed on account of his opinions, even religious, provided their manifestation does not upset the public order established by law. 11. The free communication of ideas and opinions is one of the most precious of the rights of man; every citizen can then freely speak, write, and print, subject to responsibility for the abuse of this freedom in the cases is determined by law. 12. The guarantee of the rights of man and citizen requires a public force; this force then is instituted for the advantage of all and not for the personal benefit of those to whom it is entrusted. 14. All the citizens have a right to ascertain, by themselves or by their representatives, the necessity of the public tax, to consent to it freely, to follow the employment of it, and to determine the quota, the assessment, the collection, and the duration of it. 15. Society has the right to call for an account of his administration by every public agent. 16. Any society in which the guarantee of the rights is not secured, or the separation of powers not determined, has no constitution at all. 17. Property being a sacred to and inviolable right, no one can be deprived of it, unless illegally established public necessity evidently demands it, under the condition of a just and prior indemnity.